An all-star cast takes audiences on a memory journey of war, loss, friendship, and patriotism as genuine human emotions are dealt with through comedy and grief. Amazon Studios hits a homer again with the release of Last Flag Flying distributed by Lionsgate. Now in select theaters, writer-director Richard Linklater crafts an incredible motion picture that organically deals with the loss of a loved one during a time of war through the stages of grief and irreverent comedy between friends. While this film is currently flying under the radar, don’t allow that to dissuade you from watching this incredible war film. I cannot remember the last time that I saw a film that felt so genuine. Watching this film, I truly felt like a fly on the wall, watching a Vietnam vet deal with the loss of his son and reconnecting with some of the closest friends he ever had in his life. 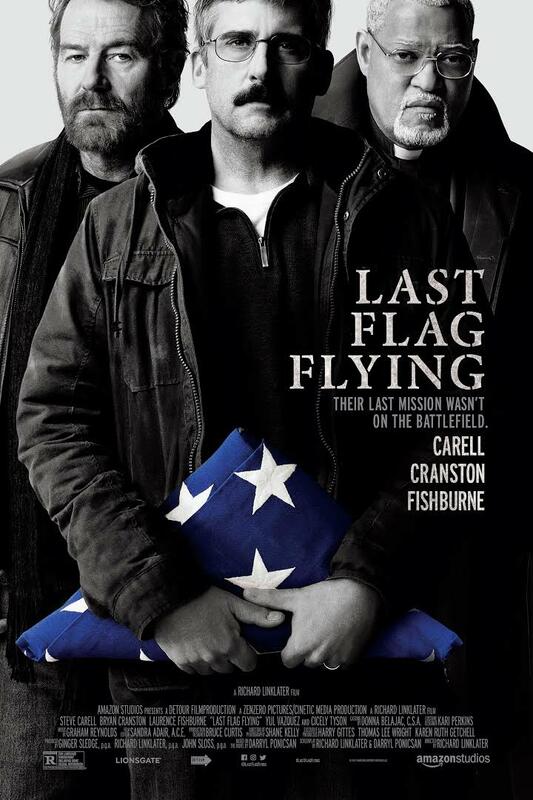 Last Flag Flying is a subgenre of war movies that places the camera at a distance from the characters and allows them to mourn and laugh on screen without interference from censors and other outsiders. While not a conventional war movie, the topic of war is found underlying many diegetic components. Dialogue driven, this film provides social commentary on patriotism, God, and friendship. Bring your listening ear to this movie because the context of the tough subject matter contains subtle yet powerful messages that highlight otherwise unstated emotions. Sometimes the best way to go through the stages of grief is to throw caution to the wind and allow humor to work its powerful remedy. Three Vietnam war veterans reunite for a different kind of mission that forces them to deal with the present and the past. When Larry “Doc” Shepherd (Steve Carrel) arrives at the dive bar that belongs to former comrade Sal Nealson (Bryan Cranston), he asks his Marine brother to go with him without naming where. Sal drives Shepherd to a old country church now pastored by their Marine brother Richard Mueller (Laurence Fishburne). When Shepherd doesn’t touch his pale cobbler, the group realizes there is something wrong. It’s then the Shepherd reveals that his son was killed outside of Baghdad, and wants his two Marine brothers to go with him to bury his son at Arlington. Along the journey, the three former military comrades are forced to come to terms with their shared past that continues to shape their present lives by discussing tough topics such as grief, God, war, honesty, and addiction. The sheer storytelling beauty of Last Flag Flying is found in the solid writing made evident through the excellent direction and A-list cast (and one surprising cameo that I won’t mention because it will detract from the brief but powerful screen presence). While it may appear like a somber tragedy on the surface, beneath that surface of sadness beats the heart of dark but respectful comedy that takes audiences on the memory journey right along side the characters. War movies about the loss of loved ones is not something new; but this film allows the characters to go through the stages of grief in organic ways that paints a motion picture of how human these emotions are. Human. Truly human. At times, there are no holds barred when three very different voices all converge on the same topic. You have the grieving father, a reverend, and foul-mouthed barkeep discussing everything, just as friends in real life often do. In many ways, these three former military comrades could not be any different in their present states; but at one time, they were inseparable and very much alike. While the focus of the film could have been on Shepherd’s loss or the politics of war, the focus is clearly on what makes us human and how one genuinely has to deal with loss due to war. Not that discussions of politics and religion are not found in this film–they are–but the discussions and arguments between these friends are used as tools to comment on the human condition. Because we never see combat footage, the expositional dialogue about war and politics adds incredible weight and a little mystery to the events in the film. Before you begin to think that Linklater uses flashbacks to connect the present to the past, think again. While that would have been the easy, lazy way of accomplishing that task, he chooses to connect the present to the past through exceptional exposition between characters that prompt the audience to engage their own emotions to connect the pieces of the story together. Because we never shift between the past and present, the main story is always the main story. When constructing strong characters as we have this this film, it is the responsibility of the actors (though proper direction) to not allow the actor to get in the way of the character. Honestly, there are times that I see the individual actors eclipse the respective character, but most of the time, the audience will see the characters themselves throughout the dark comedy. The cinematography is simple, but perfect for the story within this motion picture. Linklater uses no gimmicks to tell this thought provoking story. The movie has an intimate feel to it because you can likely identify with one of the lead or supporting characters, especially when they are talking about “Disneyland” in Vietnam (you’ll just have to watch to understand why that’s in quotes). So incredibly genuine. No pretense about any of the characters in the film. The content of this film truly reflects the tenor of the times in which we live. Topics of war, politics, and religion seem to be inundating us from all angles. It takes a special film to deal with each of those respectfully, candidly, and effectively. The trifecta of voices in this film allows the thought provoking conversations to transcend the screen and enter the minds of the audience. While working through his grief, there were times that Shepherd could have gone on an anti-military or anti-American rant, but he never speaks a negative word against anyone, though he is sometimes in immense pain. Patriotism, God, and the human condition are shown and discussed in quite unconventional and maybe even controversial ways; yet, the manner in which these topics are discussed, as it relates to Shepherd’s loss, are absolutely perfect. In a seemingly binary world where you are either a red-blooded patriot or you’re anti-American, with no room for nuance or discussion, this film provides the platform to begin to realize that we are first human before we take sides. Although I did not care for Linklater’s Boyhood, I can honestly tell you that this film is one that you don’t want to miss. Whether you are in a military family or not, this film offers a glimpse into a world that many people have to face on a daily basis. The genuine, organic approach to the hard topics in this film allows the humanity to shine through. Not speaking for ALL veterans, but the vets that were in the screening last night had high praise for the film. And the rest of us had many positive remarks and feedback for the screener hosts. Follow The R.L. Terry ReelView! Enter your email address to follow The R.L. Terry ReelView and receive notifications of new posts by email. Said final goodbyes to my grandma’s winter place here in Florida yesterday. Since she isn’t able to snowbird like she used to, so it’s being sold. Was nice having family close by even for just 6mos a year for the more than 10yrs I’ve lived here. I’ll miss my every other weekend visits. But as one chapter closes, another opens. I may not have this place anymore, but I still have my memories of great times there, and of course I still have grandma.